India is currently witnessing a dual burden of diseases- lifestyle diseases that are the bane of the rich world, as well as the traditional communcable diseases of the developing world. Also per capita income has been rising steadily and the nation is witnessing a change in the population/ income distribution as the 'pyramid' gives way to a 'diamond' where the middle class is steadily expanding with income shift and the poor population is reducing. These factors combined, have created an ecosystem for services targeted at pro-active prevention of onset of lifestyle ailments. This ecosystem forms the Preventive Healthcare. Consumption related to preventive healthcare has been rising steadily over the years but quantum of growth has grown by leaps and bounds only recently. While the retail consumption in India is growing at an annual rate of 12% which is much beyond the world average of 5%; the preventive healthcare market has been growing at 18% CAGR. This phenomena of high-level growth calls for an in-depth study into it's drivers and the economic sectors that are impacted thereof. Also, It is at this juncture that we are witnessing a sudden rise in the number of health tech start-ups and the attention that they are garnering from the investor community. At Redseer we are suitably positioned to examine the dynamics of the industry with our industry practice, depth in internet space and our strength as an advisory firm in the investment fund space. 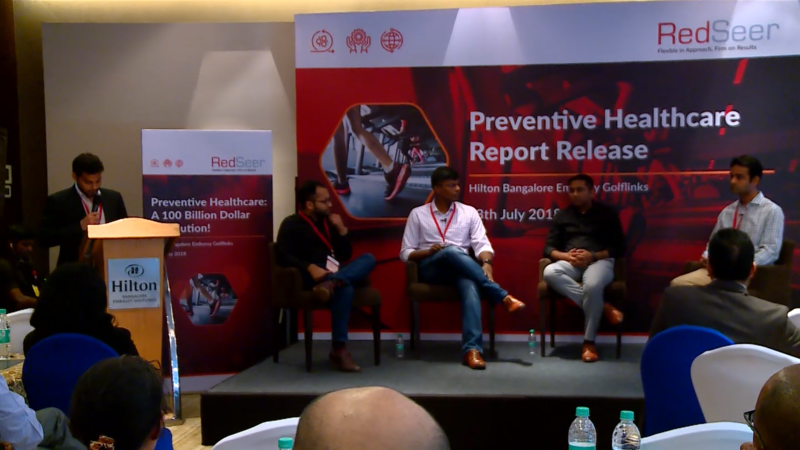 Preventive healthcare industry in India is at the brink of expansion as the services in the healthcare market becomes expensive by each passing day. This report deep dives into multiple sectors that affect the lifestyle of consumers today and studies them through the lens of ailment-preventive impact that they have on consumer's living. The sectors that have been covered include healthy foods and nutraceuticals, fitness and recreational sports, health monitoring and diagnostics, wellness therapies and tourism, health insurance and specific elements of primary care such as mental healthcare, telemedicine and physiotherapy. Healthcare sectors that come into play when consumers seek prescription or cure do not form part of preventive healthcare, e.g. most of primary care, medical monitoring devices and medical tourism. Each of the sectors have been evaluated for growth potential, maturity of technologies and players and rising willingness of consumers to spend going forward. With this in mind, from the larger population – a class of consumers have been identified that will form the early adopters of any new service or technology in prevention of onset of lifestyle related diseases. These consumers have been labelled as 'Health Conscious Individuals' (HCI's). Habits and practices of HCI's have been analysed and their adoption rate has been estimated in context of key sectors. 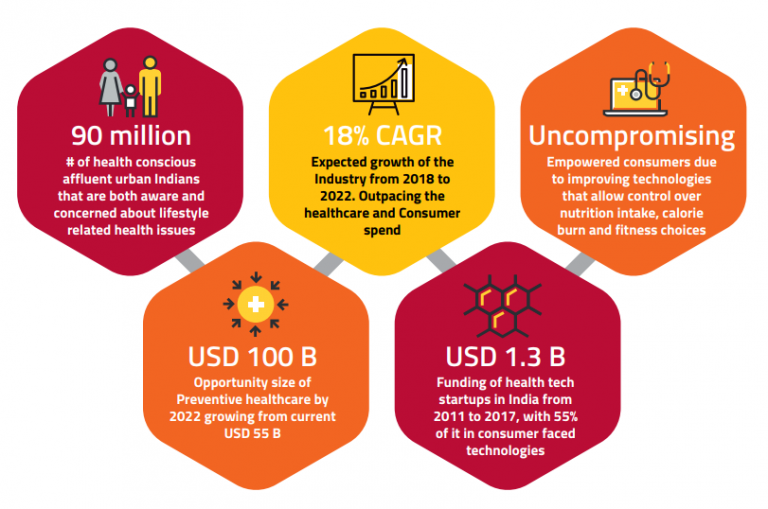 This report details out the demographics pertaining to lifestyle ailments in India followed by overall market landscape of preventive healthcare. 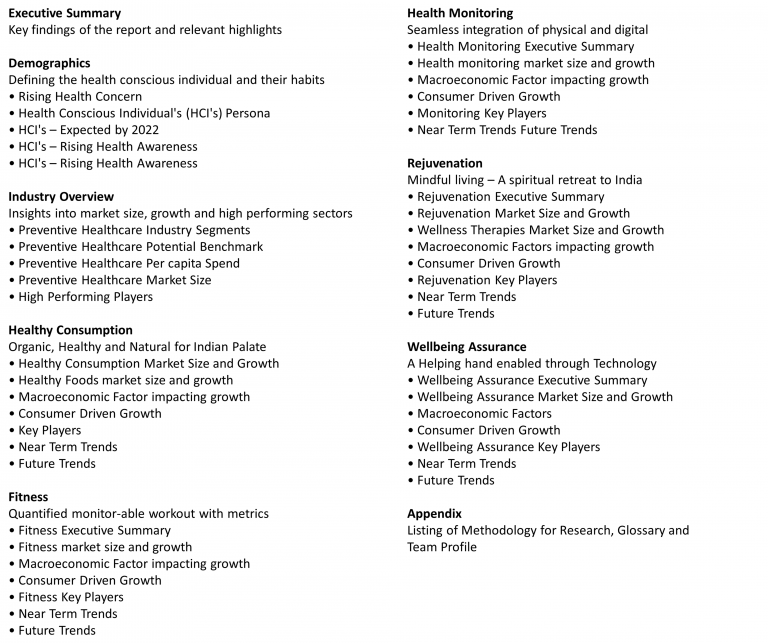 Further it deep dives into individual segments laying out their market potential, demand drivers, consumer trends, key technological trends and key player. 90 Million Health Conscious Individuals who are affluent, living in urban areas and are both aware and concerned about lifestyle related health issues. They fall under all age groups and are separated into different personality types of activated youths, motivated movers, concerned changemakers and budding based on their motivations for fitness, activities sought and level of participation in fitness activities. USD 100 Billion is the estimated size of the preventive healthcare segment by 2022, growing from USD 55 Bn in 2018. Healthy consumption at 30% followed by fitness at 27% has the largest share of this pie. Megasectors of the segment are those that have grown to a substantial base and will continue to grow at a good pace; they are recreational sports, wellness therapies and diagnostics. 18% CAGR is the expected growth of the industry from 2018 to 2022; outpacing the consumer retail spend growth rate. This growth is being driven by mega-sectors such as recreational sports, wellness therapies as well as by new-age sectors such as fitness wearable devices and health meal delivery. USD 1.3 Bn is the total funding that health tech startups have achieved from 2011 to 2017, with 55% of it being in consumer faced technologies. Of this, USD 333 Million in funding came in 2017 alone. This is encouraging startups too come up with early detection techniques for ailments or to increase speed and accuracy of pathology. Uncompromising consumers have been empowered with innovations in technology that allow control over nutrition intake, calorie burn and fitness choices. High level of personalization in health products to meet Indian tastes, skin tones and ever growing choice in fitness/sports activities to suit each individuals body needs and interests is a reality today.